My Grandma always, always had a jar of these in her fridge. Along with her fantastic chili sauce, but I never got the recipe for that… which is a real bummer. My brothers and I always looked forward to dinner at Grandma’s though because we just knew these gorgeous, tasty beets would be gracing the table. 2. Prepare beets; leave the root and approx 2” of stem intact to prevent bleeding. Scrub thoroughly and sort by size. Place the larger beets on the bottom of a saucepan and smallest on top. Add water to cover; bring to a boil and cook until tender, approx. 30-40 minutes (depending on size of beets). Remove beets from saucepan as they are cooked and run under cold water. Drain and let cool enough to handle. Slip off skins and remove tap root and stems*. Leave baby beets whole and slice or quarter larger beets. 3. Tie pickling spice in a square of double folded cheesecloth, creating a spice bag. 4. In a large, stainless steel saucepan (do not use aluminum or enamel), combine vinegar, water, sugar and spice bag (tie spice bag to handle on pot). Bring to a boil over medium-high heat, stirring to dissolve the sugar. Reduce heat and boil gently for 15 minutes, until spices have infused the liquid. Discard spice bag. Add beets and return mixture to a boil. 5. 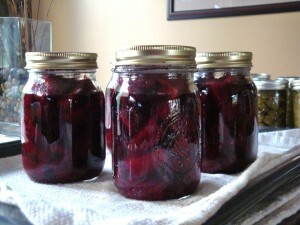 Using a slotted spoon, ladle beets into hot jars to within a generous ½” to top of jar. Ladle hot pickling liquid into jar to cover beets, leaving a ½” headspace. Remove air bubbles and adjust headspace if necessary. Wipe rim. Centre lids on jar and screw band down finger-tip tight. 6. Place jars in canner, ensuring they are completely covered with water. Cover and bring to a boil and process for 30 minutes. Turn off heat, remove canner lid and let jars sit in canner for 5 minutes. Remove to a rack to cool and let sit for 24 hours. * Wear rubber gloves to avoid pink fingers and nails! Here is how to guarantee freshness in your pickling spice – Make your Own! In a small bowl, combine all ingredients and stir well. Store in 4-ounce jars or airtight container for up to a year. Makes ½ Cup. I LOVE PICKLED BEETS!! I made some a couple of years ago, and would love to do some more. I really should just make the time.